I created an App-V package of Adobe Photoshop CS5 using the App-V Sequencer. I already read that Adobe Photoshop CS5 was quite a hassle to get sequenced, so I followed a couple of advices I found through Google. The sequencing was actually quite smooth although lengthy. After importing the .sprj file into the Application Virtualization Management Console and starting a Server Refresh in the Application Virtualization Client it consistently refused. The error I got was 4615186-19D0810A-10000005 which is actually quite well known in the App-V community so it seems. The refresh, that usually takes a couple of seconds, timed out after 20 seconds. During that time it was showing the status Ongoing. I did a LOT of debugging before I found the cause of the error. Enabling verbose logging on server and client didn't reveal anything more than I already knew. The solution was kind of a longshot, but removing all File Type Associations did do the trick. Afterwards I tried removing them a couple at the time, but I didn't find a specific one that was causing it all. Thankfully it was working when I removed everything but the PSD extension, as that's the bare minimum I wanted. 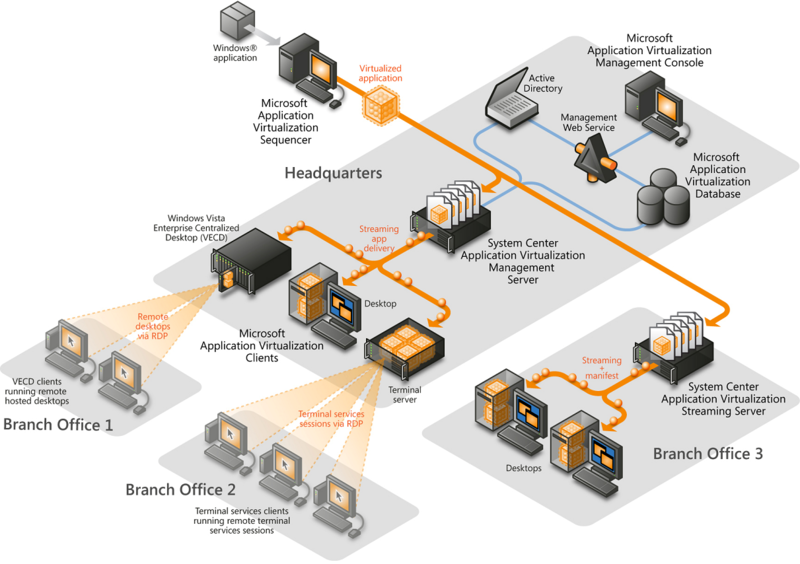 Application Virtualization is not the most commonly used technology. However there are quite a lot of advantages to using this software over using GPOs or manually installing software. Application conflicts - Applications are running in an isolated environment and are therefore not conflicting with other applications installed on the computer. Combine dependent applications in a single package - Deploy a single package to multiple clients without having to worry about dependencies. As with most software there are some alternatives to App-V. Make sure that you know the pros and cons of each before you make your decision. I'll skip the pros and cons because these will change quite rapidly and you probably already decided on App-V.
App-V consists of a couple of components. App-V Management Server - Delivers the sequenced applications on-demand. App-V Management System - Consists of the App-V Management Console and the App-V Management Service. App-V Sequencer - Produces the application package consisting of a couple of files. A MSI file can be included for offline deployments. App-V Streaming Server - In charge of streaming the packages to clients that lack a good connection to the Management Server. App-V Client - Is installed on the OS of the end-user and communicates with the Management Server. Manages package streaming into cache and publishing refresh, also stores the user-specific information related to the package. You can find the hardware and software requirements for all the components here. There are several ways of implementing App-V into your environment depending on your requirements. The minimalist mode of App-V doesn't require any infrastructure except for the App-V Sequencer and the App-V Client. The packages can be deployed manually, using group policies or using System Center Configuration Manager (SCCM). This is mostly used for smaller companies, and companies that have a lot of Offline users. This model is mostly focused on platforms that don't want to run Management Servers. This means that a SQL database is not needed and the permissions are set through ACLs. The difference with the previous model is that by adding the App-V Streaming Server component the applications can be streamed to low-bandwidth clients like clients in branch offices. By utilizing all components of App-V you gain the full advantage of the technology. You can choose not to install the App-V Streaming Server component if you don't have clients on low-bandwidth connections. Using the App-V Management Server will add the application shortcuts within the process of deployment, and also enables features like reporting using a SQL database and central management of application licenses. As the management server is using SQL and IIS we'll need to make sure that these are setup correctly before we start. This will minimize the possibility of errors during the setup process. Now we need to tweak IIS a bit by adding some MIME types needed in App-V.
After downloading the Microsoft Desktop Optimization Pack (MDOP) unpack, mount or burn it. I choose not to enable the Use enhanced security for now. You can enable this later if you want to. Click Next. Enter the group name that you want to give administrative access to the App-V Management Console. It will resolve the group and allow you to select a group if multiple results are returned. Click Next. Enter the group name that you want to give access to the App-V application packages. It will resolve the group allow you to select a group if multiple results are returned. Click Next. Here you can change the default location where the application content will be stored. Accept the default and click Next. An installation result will be given and a reboot is requested. After the reboot there are still a couple of tasks to preform. Share the content folder - The default folder (C:\Program Files (x86)\Microsoft System Center App Virt Management Server\App Virt Management Server\content) will have to be shared to the clients access to the installation packages. Set permissions on the content folder - People that need to use the App-V packages need to be able to access them. Therefore the permissions need to be set to allow this. Now we need to change a couple of App-V settings to make it all work properly. You can now start the Application Virtualization Management Console. 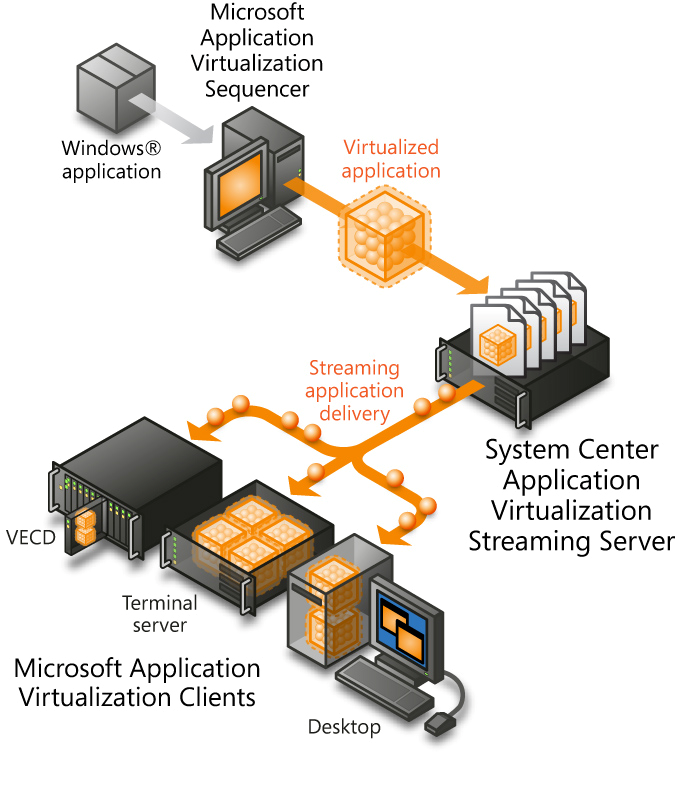 To make sure that everything is working you can install the App-V client on a workstation and see if the Default Application will stream and run properly. You can always comment below if you run into any errors.